X-ray photoelectron spectroscopy (XPS) is the most widely used surface analysis technique to provide both quantitative atomic concentration and chemical state information of the detected elements. X-ray irradiation of surfaces results in the emission of photoelectrons whose energies are characteristic of the elements. The information depth is approxima­tely 5–7 nm. Angle-resolved XPS offers non-destructive resolution of structures within the XPS sampling depth, e. g. layer ordering, composition and thickness can be determined. Moreover, XPS can be utilized for sputter depth profiling to characterize thin films and multi-layer systems by quantifying matrix-level elements as a function of depth. The gas cluster ion source additionally enables sputter depth profiling of organic materials while preserving the chemical information. Fig. 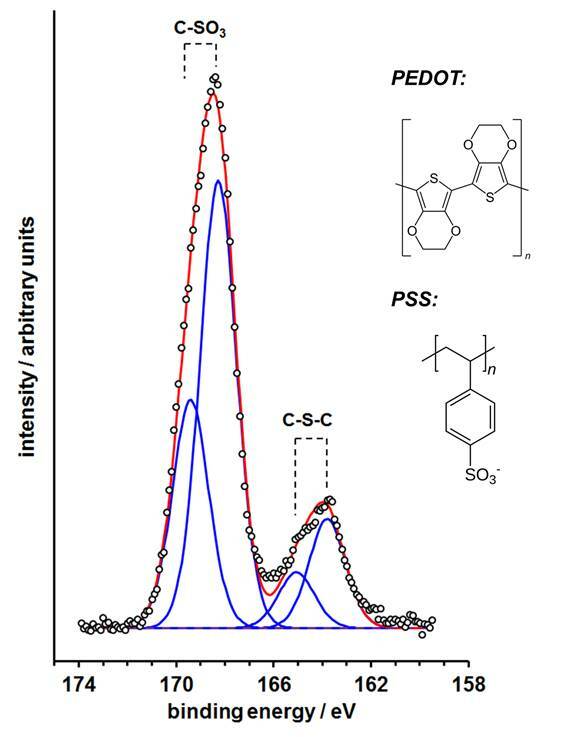 1: Non-degraded S 2p XPS spectrum of a PEDOT:PSS thin layer after 1000 s Ar1000+ cluster ion sputtering using the K-Alpha+ MAGCIS source at 8 keV energy. Fig. 2: Rapid snap map chemical image and respective overlaid video image of a gas sensor micro array (SiO2 chip substrate, SnO2 detector field subdivided by 50 µm Pt electrodes). Fig. 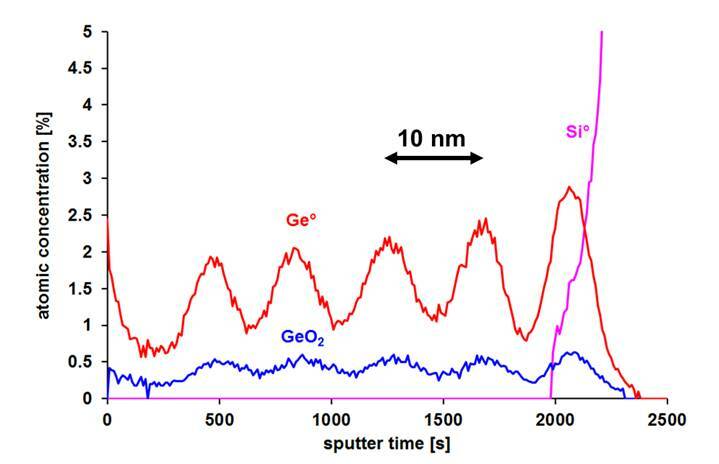 3: Mono Ar+ ion sputter depth profile of a sputter deposited Ge-SiO2/SiO2 multilayer system.